PM2.5 are fine particles of air pollution smaller than 2.5 micrometers — small enough that they can pass through our body’s filters and enter our lungs and cells. In fact, PM2.5 pollutants can be touched, tasted, and obviously seen whenever you look out the window at a Shanghai skyline or a Beijing avenue. Smog and urbanization go hand-in-hand around the world, and China is certainly no exception. Many people living in China’s cities, native and foreigner alike, don face masks during air quality alerts in hopes that they can halt the worst of the pollutants. But often, even masks have proven ineffective. Are these hopes futile? In 2015, Beijing’s PM2.5 level averaged 8 times what the World Health Organization considers “acceptable for human health”. And the capital city is not alone — many of China’s major cities face hazardous smog levels. With studies showing that China’s elevated PM2.5 levels contribute to 1.6 million deaths per year, its direct health impacts on the exposed population are an issue of growing concern to the Chinese public. The pervasiveness of China’s high PM2.5 pollutant concentrations paints a profound picture of China’s true smog problem. 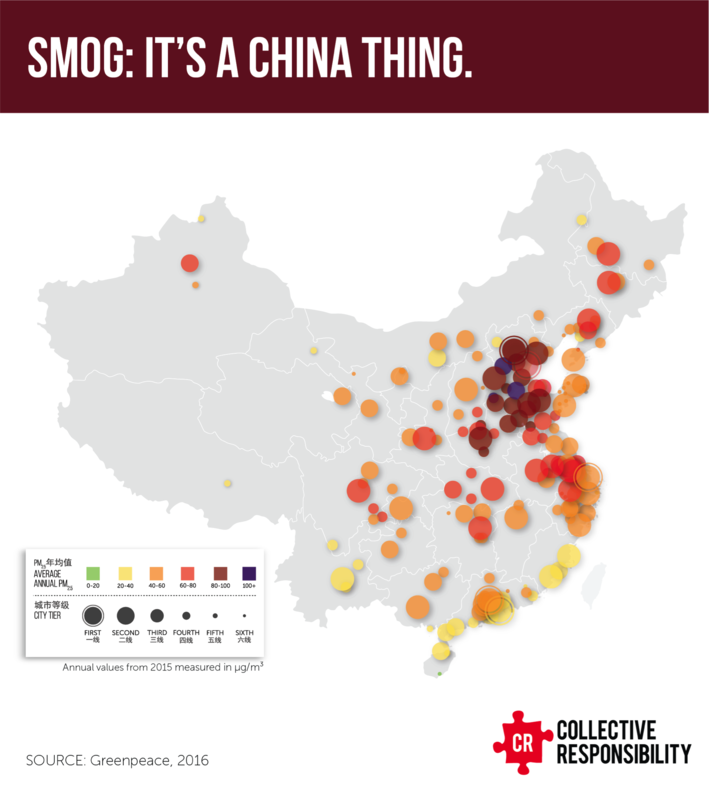 This month, we at Collective will be releasing our new report on Air Pollution in China, analyzing the complex social, economic, and environmental context and issues surrounding the pervasive smog and pollution in China’s cities, as well as highlighting current and future actions by the major players to lead towards a Mask-Free China. Follow us to receive updates for when our report is released. This article was prepared and adapted from our content by Gabrielle Williams, Research Analyst at Collective Responsibility. Tags: air, China, energy, Pollution, urbanization.